Clarks is an international shoe retailer and manufacturer. The USA Clarks online store offers a variety of shoe styles for men, women, and children. From flip flops and flats to high heels and loafers, the USA Clarks online store has a shoe style for any occasion. With Big Apple Buddy’s personal shopping service, you can now buy direct from the USA Clarks online store anytime, anywhere. The Clarks Concert Band Patent Leather flat comes in navy, black, and brown. This shoe will give you a polished, elegant look but ensure you remain comfortable with a low heel and luxurious lambskin linings. 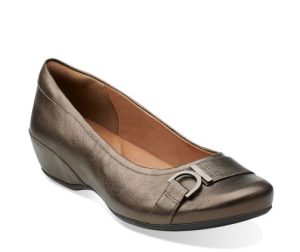 Dress this feminine flat up or down with ease, and choose a color that appeals to you most. This lace-up Clarks Gatley Limit shoe for men is crafted of premium leather and is available in either tan or black leather. 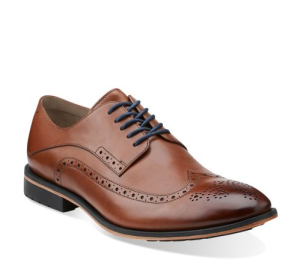 Whether this shoe is paired with a suit or with denim, it will help add refinement and elegance to your overall look. And with a removable Ortholite footbed, it ensures comfort for as long as you’re wearing them. The Clarks Temira West Leather sandal is the perfect addition to your closet this summer. 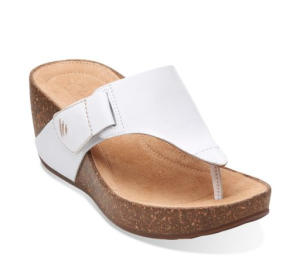 This cork wedge comes in both white and beige leather and goes great with shorts, jeans, skirts, and dresses. This carefree shoe will easily take you from daytime to night with not much effort in between. Unfortunately, the USA Clarks online store does not ship internationally. However, Big Apple Buddy, your personal shopper, can help you buy products direct from the official USA Clarks online store and ship them to your doorstep, no matter where you are in the world. If you would like to buy from the USA Clarks online store, simply let us know which items you would like to order (by filling out the form below) and we’ll get back to you with a free international shipping quote within 24 hours!